While manufacturers are trying to refresh the image of frozen foods and revive retail sales, some areas are reaping the benefits of going cold. Your grocer's frozen food locker is beginning to resemble Davy Jones' locker, with a dwindling shopper base a cause for concern. The steady sales descent of major categories in the frozen aisle hardly rates as a fresh observation. With the exception of ice cream, slippage in unit sales, dollar sales or both are continuing, with frozen entrees hemorrhaging the most. For the 52 weeks ending September 8, sales of today's TV dinners were off more than 3 percent by both measures, according to scanner data from multi-unit retailers compiled by IRI, a Chicago-based market research firm. Frozen pizza limped through the year with a 1-point loss in dollar volume. As grim as that is, it's an improvement from the prior year, when unit sales slid more than 3 percent, according to "Cold Facts about Frozen Foods," an October 2012 report from AMG Strategic Advisors. "In 2011, frozen food unit sales dropped to 2008 levels," the report observes. Trying to reverse the slide, a coalition of major manufacturers, including ConAgra, Nestle USA and H.J. Heinz, plans to spend up to $50 million on a frozen-is-fresh message campaign, according to Advertising Age. The effort to overcome frozen's negative health perception takes particular aim at millennials, who are giving a cold shoulder to these processed foods. "In particular, younger shoppers are seeking options they perceive as both a better value and a healthier option," writes AMG analysts. The number of buyers under the age of 35 has plummeted 37 percent in five years, according to AMG. The bulk of the remaining shoppers are closer to getting their meals from a nursing-home commissary than a supermarket. Ozonated water is applied to fish at Albion Fisheries Ltd. in British Columbia prior to packaging and frozen distribution. Until last year, Canadian food-inspection authorities did not allow direct contact of aqueous ozone with food. There are glimmers of hope, however. Seafood is poised to supplant pizza as the fourth largest category at retail, and architectural/engineering/construction (AEC) companies report brisk business in helping seafood processors expand their capacities. The foodservice supply chain may be the greatest cause for optimism. With sodium and other preservatives out of favor, clean-label products are being subjected to extreme cold before going through distribution, and many manufacturers are flash-freezing or blast-freezing finished goods that will be slacked off when they reach a store or foodservice outlet. Baked goods are a prime example. Be it bread and rolls or dessert items, products sold as fresh at ambient temperature are increasingly likely to have undergone freezing. Rather than multiple direct-store deliveries to its restaurants, McDonald's has directed bun suppliers to ship frozen products to distribution centers, where store orders are consolidated into a single delivery. Bakeries also are discovering value in freezing. Amoroso's, a Philadelphia bakery whose sandwich roll is considered essential for authentic hoagies and Philly cheese steaks, has achieved a national profile thanks to flash freezing. Now the focus is on maintaining that strength while driving down costs. In partnership with Atlantic City, N.J.'s Ginsberg Bakery, Amoroso's established the contract manufacturer Omni Baking Co. in 1996. Since 2003, Omni has operated a 171,000-sq.-ft. facility in Vineland, N.J., producing par-baked and thaw-and-serve goods. Lacking mechanical refrigeration, Omni relies on a battery of cryogenic freezers to lock in moisture and freshness in products distributed across the country. Omni Baking was the first food companies to install Linde's new flash freezer, the Cryoline XF spiral. Increased product exposure to liquid nitrogen results in faster freezing in a smaller footprint. Cryogenic freezers require less space and capital investment than ammonia refrigeration, but they also elevate a plant's gas salesman to major-supplier status. Omni already had four cryogenic freezers in 2009 when it agreed to test a new cross-flow spiral freezer from Linde North America, its Murray Hill, N.J., supplier of liquid nitrogen. "Linde reached out to us to be the R&D site for the freezer," which uses a cylindrical shape to improve the flow of air and nitrogen across the belt for faster heat transfer, recalls Dan Mulloy, general manager of Omni. "The freezing's a little more intense because of the amount of air blowing across it, and the footprint is smaller than freezers with similar throughput." Cleaning and sanitation is accomplished "in probably half the time" because a sloped floor eliminates the need to squeegee water to drain, he adds. Mark DiMaggio, head of food and beverage at Linde, maintains the cross-flow freezer uses 15 percent less gas than a conventional spiral-in-a-box cryogenic freezer. Mulloy says he hasn't compared per-unit freezing costs for the new vs. older units, but he believes savings are "in the teens" in terms of gas consumption. The cross-flow's compact design is another plus, but rapid freezing may be the greatest benefit from both a quality and yield perspective. "A raw hamburger typically experiences 0.5 percent dehydration in a mechanical freezer," according to DiMaggio. "With impingement freezing at -200 degrees Fahrenheit, we can lower it to 0.1 percent. We can often increase yield 4, 5, 6 percent by reducing dehydration," more than enough to offset cryogen costs in a high-throughput application. Value-added protein foods are fertile ground for flash-freezing, and DiMaggio cites the emergence of convenience stores as sellers of sandwiches and fast meals as a prime opportunity. "Small chains have grown significantly in quick service foods," he observes. "The cryogenic option offers them an inexpensive way to increase throughput," and he believes increased throughput is the primary reason for using the technology. DiMaggio pegs the cost of cryogenic freezing at 3-4 cents per pound, and the cost of maintaining food in a frozen state throughout the supply chain adds more cost. Optimized freezing technology is therefore central to both controlling costs and maintaining margins. One way to increase throughput and improve product quality simply is to freeze at a lower temperature. More fans and higher-velocity air helps, but dialing down the thermostat has the biggest impact. "At -20 degrees Fahrenheit, CO2 is about the same efficiency as ammonia," notes Luke Facemyer, director of design for refrigeration at Jacksonville, Fla.-based AEC firm Stellar. "At -30 degrees or -40 degrees, CO2 is more efficient on the low side" of a cascade system that combines an ammonia loop and a carbon dioxide loop as refrigerants. Until a decade ago, cascade systems were concentrated in Europe. Then, in 2003, a European food company commissioned what was believed to be the world's largest application in Jonesboro, Ark., where Nestle opened a 525,000 sq. ft. Stouffer's and Lean Cuisine facility. Stellar was the AEC firm on the project. Since then, the company has designed a dozen more, Facemyer estimates. Keeping ammonia out of processing and warehouse areas is part of cascade's appeal, but when the temperature set-point is dialed down to -30 degrees, CO2 can lower energy costs 10-15 percent. The physics of freezing are not subject to change, but today's freezers are more efficient than those of the not-too-distant past. "Before, it was just an evaporator in a box," Facemyer scoffs. Now, the velocity and direction of air flow is tightly controlled to achieve a better heat-transfer coefficient, and VFDs on fans throttle back power consumption. Value-added protein products are lifting many food companies out of the commodities game. Poultry products that are glazed, marinated or otherwise further-processed are among the stars of grocers' freezer aisles. Releasing those products from a steel or wire-mesh belt is a challenge, however, and some companies have turned to plastic belting. Plastic brings its own baggage to freezing. A plastic belt lacks the structural integrity of steel, and sagging under heavy loads is a problem that may require additional belt rails. Airflow is another issue: Modular belts are denser than their metal counterparts, which means air flow through the belt is constricted, resulting in longer dwell times. Ashworth Brothers Inc.'s answer was to split the difference with a hybrid design that combines stainless-steel support rods and acetal modules. According to John Lasecai, chief engineer at Ashworth, Winchester, Va., independent testing has quantified significantly reduced air pressure drop across Advantage hybrid belts compared to all-plastic modular belts, resulting in faster freezing and higher throughput. "Plastic is important for product release and also for sanitation because of loose meat that might get caught or poultry with a sugary glaze, which can act as a binding agent," Lasecai says. A cautionary note with plastic is the abrasions and scratches that can provide harborage for bacteria. "We don't recommend plastic for all applications," he allows, and the bulk of the firm's belting sales are still metal, but for freezer conveyance, hard plastic modules offer advantages. To revive frozen sales, product packaging also could stand a makeover, particularly in terms of plastic films that are greener. Retailers are pressuring suppliers to use recycled content, both for products in freezer cases and those shipped frozen and sold as fresh, maintains Roman Forowycz, chief marketing officer at Clear Lam Packaging Inc. in suburban Chicago. The functional performance of rollstock "made from old soda bottles" has derailed many migrations to more contemporary packaging, however, causing manufacturers to move slowly. Tyson Foods is introducing an all-polyethylene pouch that does away with adhesives for easier recycling, but it's taking the frozen-chicken product on the road to Mexico before introducing it stateside. Citing forecasts of 6.5 percent annual increases in demand for recycled plastic, Forowycz says Clear Lam has responded by incorporating additives that overcome issues of impact strength and durability in freezer-grade rollstock composed of 50-95 percent recycled polyethylene terephthlate. "The CPGs and retailers in America have moved the supply chain into more sustainable packaging," he adds. "For frozen applications, we have to address the performance issues and make sure we're not adding cost and, preferably, removing cost." If you don't live within an easy drive of the ocean or work on a trawler, the seafood you consume most likely was in a frozen or near-frozen state at some point. Even so, processors have to take steps to knock down spoilage organisms and bacteria if fish is to pass as fresh. Ozonated water is an increasingly popular option, though it only recently was approved for direct contact with seafood in Canada. Albion Fisheries Ltd. used a portable ozone generator to create sanitizing water for cleaning equipment and food-contact surfaces in its old processing plant in British Columbia, and managers wanted to include a centralized system when it built a 70,000-sq.-ft. facility in Richmond, B.C. While FDA approved ozone for direct contact with food in 2001, and U.S. seafood processors began using it even earlier, Health Canada had not considered expanding ozone applications until it received a petition from Ozone International LLC, Albion's Bainbridge Island, Wash., system supplier. "It took two years and was a long time coming, and it was a bit frustrating for Canadian processors," relates Mark Dennis, the firm's vice president-sales. Worker safety issues and unreliable controls that produced spotty results plagued ozone applications throughout North America in years past, giving ozone a black eye with many food companies. "All they remember is that ozone didn't work," Dennis sighs. Health Canada gave its blessings in time for the December opening of Albion's new plant, where ozone-resistant piping delivers treated water to 20 rooms used for processing, receiving, storage and other operations. "High loads of bacteria will destroy the fish before they go to the freezing plant," notes Musleh Uddin, Albion's director of corporate quality assurance. "There were some worker concerns about off gassing, but if you explain ozone is eco-friendly and better than chemicals, you can get past those concerns. After nine months of use, the concern is gone." Albion Fisheries Ltd. in Richmond, B.C., is among the fast-growing suppliers of frozen seafood who are adding capacity and leveraging technology to extend shelf life. The company opened a new facility in Richmond, B.C., in December. A powerful oxidizer, ozone is inherently unstable, with the three oxygen elements seeking stability by attaching to carbon, hydrogen and other atoms. Albion's system generates ozone at a 1.5 ppm ratio; when it reaches the point of use, the concentration is 1.2 ppm, and within 30 seconds, it completely dissipates, according to Uddin. Residual amounts become airborne at less than 0.3 ppm, enough to knock out any yeast and mold but not enough to affect human health. "It's almost like a sterilized plant," he adds. "Health inspectors have commented that there is no fish smell in the building." Albion's product portfolio includes a line of sushi. "We cannot stop the lipid deterioration with normal freezing, and if fat oxidizes, you get bad odors," comments Uddin. "Any food intended for raw consumption requires -30 degrees Celsius." Choosing to err on the side of caution, the firm holds sushi at -70 degrees Celsius/-94 degrees Fahrenheit. 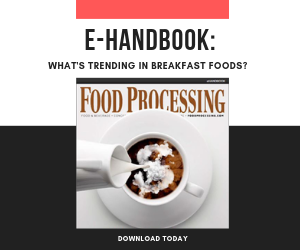 In fact, many processors of frozen foods are dialing down the thermostat to improve product quality and counter the category's image problem. Sharper pricing and innovation also would help. AMG concluded manufacturers introduced 22 percent fewer new products in 2011 than in 2009. "Finding ways to entice younger shoppers into the department needs to be a priority for manufacturers and retailers," the consultants emphasized. More R&D, marketing muscle and better packaging surely would help, along with a commitment from manufacturing professionals to control costs, maintain the cold chain and deliver on the promise of nutritious products. Regardless of frozen's future at retail, the technology behind it is here to stay. Consumers love the convenience, and when done right, frozen foods can be a blockbuster. Co-branding, innovation will return the frozen foods category to sales health. Cascade systems and more efficient blast cells can lower the cost of freezing food products. Are Frozen Foods On Thin Ice?